Get perfectly curled hair every time with the ghd curve® wand range. Whether you've got long or short hair, our curve® wands can help you can create loose relaxed waves or tight defined curls without all the hassle. Style your way to hair perfection with the ghd curve® wands and achieve a salon finish every time, thanks to our patented tri-zone® technology. 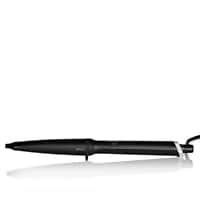 Choose the ghd curve® classic curl wand to achieve effortless Hollywood waves that are guaranteed to last, or if you’re looking for a chic festival curl style, the ghd curve® creative curl wand is a styling must-have. Lifeless curls and waves are a thing of the past thanks to our ghd curve® wand range. I found curling someone else's hair easy & it looked really awesome. But I am finding it difficult to master curling my own hair at the moment without burning my fingers. So best to invest in the glove, which should really be included in with the curlers. I got this curl wand for my birthday and the wand creates lovely soft curls. I have used this so much already and get compliments every time I use it! The only downside is that the curls do drop after a while and I find on my hair they don't last quite as long as stated! Overall really pleased with the curl wand.